Turmeric or haldi as it is more commonly known in Indian households is a natural yellow food colouring. It was traditionally called "Indian saffron" because of its deep yellow-orange colour. When turmeric is cooked and dried, it possesses a mustard-like taste and a brilliant yellow colour. Hence it is extensively used in Indian, Spanish, Mediterranean, and Middle Eastern cuisine. It is an indispensable ingredient of curry powders and is used mainly in pulse preparations as it improves digestion and prevents the formation of gas. Besides, it has found application in canned beverages, baked products, dairy products, yoghurts, biscuits, popcorn-colour, sweets, cake icings, cereals, sauces etc. The colouring matter of turmeric is due to the curcumin pigment. Studies have substantiated that curcumin also exerts very powerful antioxidant effects. As an antioxidant, curcumin neutralizes free radicals (chemicals that cause great amounts of damage to healthy cells and cell membranes). Recent research suggests curcumin has anticancer properties too. 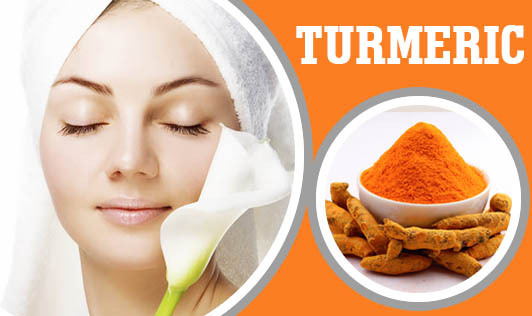 As a common home remedy, turmeric is most effective in curing throat irritation during colds.